Research is an exploratory activity that involves outlining what you are trying to learn, what you are going to do to learn it, and then getting out of the building to gather data (in the form of Evidence). Once that data is collected, the team does their analysis about what it means and updates the project. These steps correspond to the Plan, Run, and Analyze phases. The Plan phase allows you to enter research details and map out your research. Choose a short Research Name that will be easy for your team to recognize and reference. Then, define your Research Objective. What are you trying to learn or achieve? Succinctly describe the intent and any necessary context for this Research. Next, add Details about how you will test this: describe the research you will conduct. 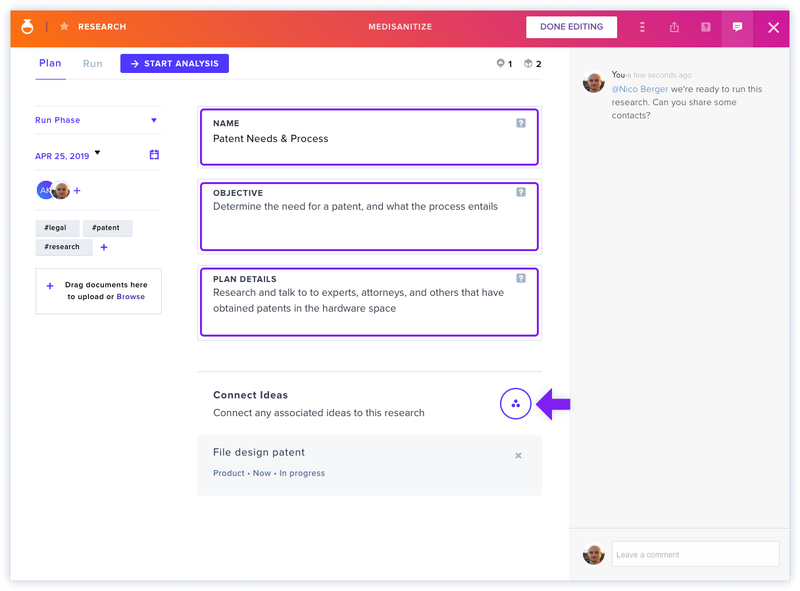 If you have specific Ideas in mind, use Connect Ideas to test ideas with this research (this step is optional). Select all ideas to test with this research (or click New to create and publish a new idea), and click X to close. When finished, click Run Research to move to the Run phase. Find out more about planning Experiments here.